Tomb Raider: voted most favourite game zone! We recently carried out a survey amongst our regular players to find out which game zone they enjoy playing on the most. It’s not surprising that it’s the long standing Tomb Raider game zone, a staple game zone at Delta Force paintball centres across the UK. We have a new style pyramid at a number of our paintball centres – below is the latest addition to the paintball centre in Solihull. This popular game zone features a twenty-foot-high ancient stone pyramid surrounded by giant sphinx statues. The pyramid and sphinxes have been custom made by a company that makes props for movies and theme-parks. Everything at Delta Force is bespoke and unique – we really care about giving you a world class day out! The aim of the Tomb Raider game sounds simple, but a lot of team work and preparation is required to outsmart the opposition. Inside the pyramid lies an amulet and each team starts at opposite ends of the zone. Whoever claims the amulet and returns it to their base will be victorious! You’ll need to act fast though, as the Pyramid can be entered from all sides – the best thing is for your team is to establish control of the Pyramid by surrounding it then quickly seize the amulet before the opposition knows what’s happening. 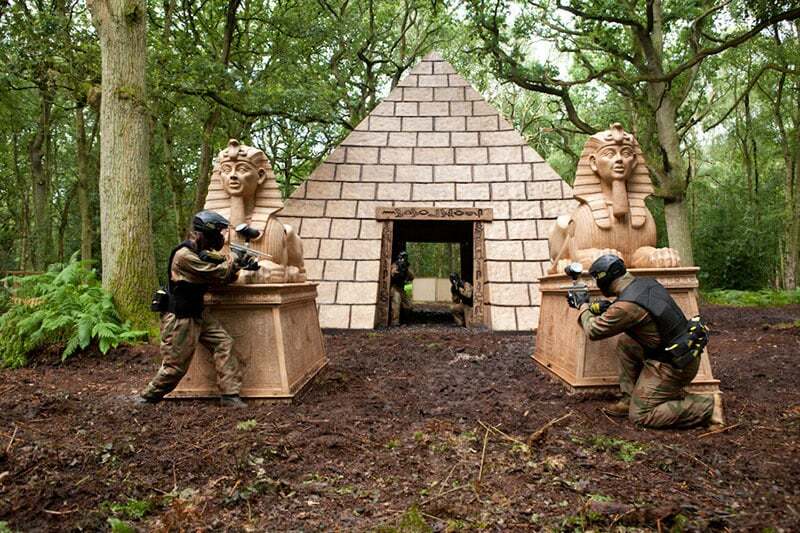 If you’d like to experience the movie-set quality game zones at Delta Force, give us a call on 0844 477 5050.